Homer Shares the Road is an education and advocacy campaign designed by the Homer Cycling Club, funded by the Homer Foundation and endorsed by the Homer Police Department. This local project encourages non-motorized road use and provides tools and reminders on how to share the road. There is a heightened level of anonymity while on the roadway. We get obscured by a windshield, bundled in a parka, or hidden under a helmet. But those individuals are the same community members that teach your children at school, cook your food at restaurants and stand in line with you at the store. The best way to share the road is to be courteous to each other. 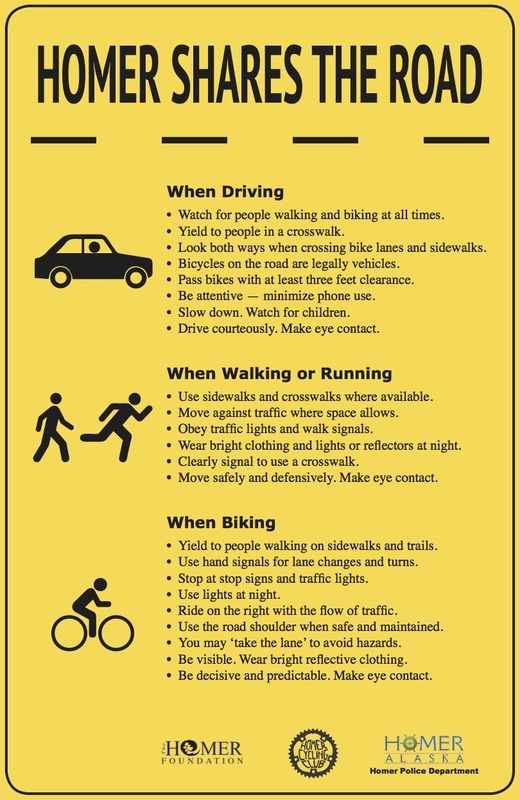 There is a lot of good information out there on how to behave courteously and lawfully on our roadways.